Technology is wonderful when you have it. For the second week, we have been labouring without our video system. Last week we discovered our housing did not survive the trip to Maui, and this week we discovered our Sony Hi 8 camera had gotten wet after all, requiring that we send it to California for a major repair. As a result, we are unable to offer any images for our weekly summaries, since our Snappy card requires some kind of video feed. Our housing is due back in the next few days, but this does little good until we get our Hi 8 video back. Even if our luck turns, we'll have gone half the summer without video documentation. The aperture control gears on our SLR housing no longer work either, so for the last few days we've been limited to a camera that has been pre-set to one aperture. Fortunately we've still managed some competent pictures but we can't even show you those because we'd need the video camera for that! This wouldn't be so bad if the diving was decent, but most days this week have been cloudy mixed with mauka (mountain) showers. This has made our murky silty conditions murkier and siltier. Usually we'll get separated about three times during a summer... we've already reached that dubious honour after only two weeks in this soup of a dive site. Today (as this is being typed) there is a swell that has made close-to-shore visibility purely wishful thinking. Despite all this, we still saw turtles. There are plenty of things we don't understand about what is happening with the turtles this summer. There are other things we're just busting to tell you, but we aren't sure about what we're seeing and would rather wait until we are. One thing we are sure about is an interesting resighting. This week, we photographed a young turtle who proved to be an animal we'd seen and documented before. We matched the young turtle's profile with a 1994 image of an animal we saw at Old Airport Beach, a popular snorkeling/diving spot less than a mile downcurrent from us. Last week, we wrote about meeting a tiny turtle who swam right up into our faces to beg for food. We speculated that it might be from Old Airport Beach, where someone is clearly feeding the little guy. The identification of an Old Airport Beach turtle at our dive site proves conclusively that Old Airport turtles do range this far, and strongly supports our theory that there is turtle feeding going on at the location to the south. Another turtle that we've seen in past years is Gotcha. Gotcha is one of the largest turtles we see. Since she hasn't yet developed a long tail, we feel reasonably certain she's female, although she doesn't yet sport the definitive proof: tags. 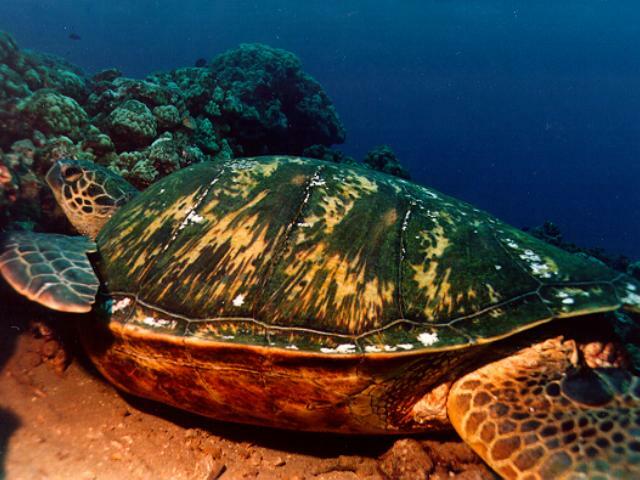 Large honu with tags and short tails are almost certainly females, tagged while nesting at the French Frigate Shoals. We first saw Gotcha in 1992, when we managed to get just a single picture of her. Back then, she was much less tolerant than she is now. We've seen her each year since then, and every year she's gotten progressively easier to photograph. This year, Gotcha pays almost no attention to us and so we've managed to get several good photos. Here's one of them. Gotcha is one of the largest turtles we see.